Rebecca Grafton lost 104 pounds with her diet plan! Rebecca Grafton a 25-year-old girl whose weight was 246 pounds. She struggled with her excess weight for many years, but when she booked her Jamaica trip she realized that now she needs to become healthy and active. She began her weight loss journey when she stopped recognizing herself on photo shoots. She wanted to remember her happy time spending on vacations and she didn't want to remember her problems of overweight. 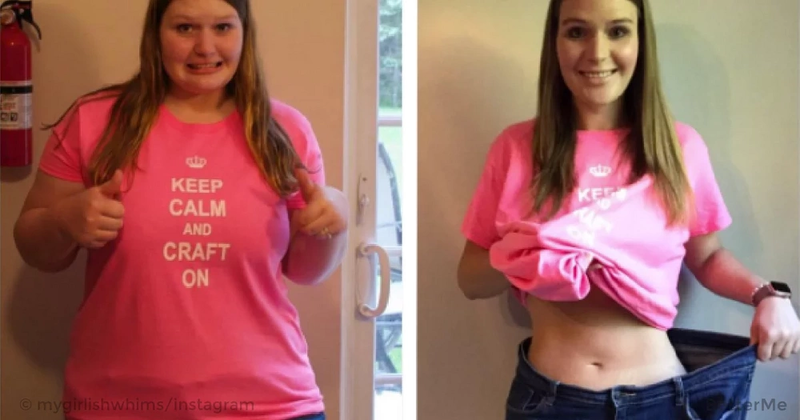 This amazing girl has lost 100 pounds in 1 year and now she continues to inspire other girls who get slimmer with the help of her blog "My Girlish Whims". Do you want to know her diet plan and exercises plan? You will be able to find this story below! Every Monday she tried to start fresh. She used to eat too much food during trips or friend get-togethers, promising that she will start a diet the next day. But tomorrow will never come. She started to control her portions and she learned how to cook food without adding lots of heavy cream and fatty cheese. The use of fresh vegetables and spices helped her to prepare delicious meals. Rebecca started to eat protein products such as eggs, chicken breast, and low-fat cheese. Rebecca started with Jillian Michaels workout videos and morning run. I was really hard for this girl to start. But when she lost most of her excess weight she was able to run 10 miles distance without any stops. Now she leads a very active lifestyle: running 2 times a week, barre class on friday, and gym workouts 3 times a week. Sometimes she used workout videos at home. Losing weight is not a really difficult thing. You do not need to invent secret remedies, pills and slimming cocktails to lose weight in 2 days. Combine healthy foods and exercise to get the body of your dreams. Perhaps slimming will take more time than you wish, but after a while you will see a great result.